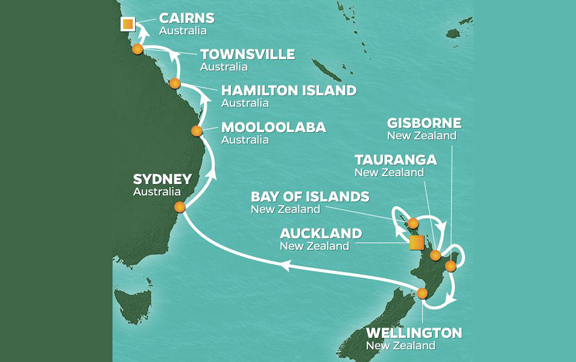 Get a taste of local island life from the shores of New Zealand to the Great Barrier Reef in Australia. We’ll take you deeper into these remarkable lands than you ever thought possible. We’ve packed in restful sea days, too, because you’ll want them. Final call! For a limited time you can save on your cruise fare with sales on select voyages. * All prices quoted are for the cruise departing on 21 February 2019. Prices for alternative departure dates may vary. * All category 08 staterooms have an obstructed view. Please note even though Club Oceanview stateroom category 08 have obstructed views, these staterooms represent an excellent value. Each stateroom features a picture window providing natural light, you will find them comfortable and welcoming with all the amenities of an interior stateroom. Specifically designed to be smaller and more sleek than most cruise ships, Azamara Quest, like her sister ship, Azamara Journey, is filled bow-to-stern with wondrous luxuries and appointments that enhance your voyage of discovery-making it one that you won’t soon forget. If you’re in the mood for fantastic Mediterranean-inspired cuisine, make a reservation at Aqualina, one of our onboard specialty restaurants. Aqualina will satisfy your taste for sumptuous fare in a relaxed, yet positively chic atmosphere. Oh the glorious views from the Looking Glass. Of all the locales to relax and unwind aboard, this might very well become your preferred spot. Enjoy your favorite cocktail, admire the Murano glass, and gaze out the floor-to-ceiling windows and revel in how good life is at the moment. There’s even a telescope so you can see what’s waiting on the horizon. Soak up the sounds of a grand piano as you share an intimate nightcap in this locale. The ambiance is inspiring and the deep, welcoming chairs of Discoveries Lounge make it the ideal place to savor a single-malt scotch or a late-evening cordial. *All category 08 staterooms have an obstructed view. Please note even though Club Oceanview stateroom category 08 have obstructed views, these staterooms represent an excellent value. Each stateroom features a picture window providing natural light, you’ll find them comfortable and welcoming with all the amenities of an interior stateroom. Our showcase theater features a talented cast of singers performing some of the hottest shows at sea. Best of all, every seat in the house is excellent and you’ll love the long, comfortable bar and excellent service. Whether you’re feeling lucky or you just enjoy the adrenaline rush of a casino, step into ours and you won’t be disappointed. You’ll find all your favorite table games, video slots, and a centrally located bar. Come take a peek at the fun and professional photos captured by our onboard photographers. You can also find an assortment of supplies for your own photographic endeavors. Aptly named, Indulgences will satisfy your desires for the finer things in life. From designer eyewear to sought-after cognac and everything in between, it’s the perfect place to window shop or to find that extra special purchase. It’s one-stop shopping at The Quest Shop. Apparel, sundries, handbags, candies, cigarettes, souvenirs and lots more await. If you find that you forgot to pack something, chances are you’ll find it at The Quest Shop. Our onboard coffee corner may very well become your favorite nook on the ship. You’ll find all your favorite coffee drinks and you can order them just the way you like them. We recommend that you slip right into a comfortable seat and sip for a while – you never know who’ll walk by. With open seating and stellar nightly selections, our main dining room, Discoveries, is not to be missed. You’ll find all your classic dinner favorites, with a deliciously different twist, like gulf shrimp with cognac and garlic or a filet mignon with black truffle sauce. How will you choose to relax today? Melt your cares away with a 90-minute massage; invigorate yourself with a lime and ginger scrub or indulge in a silky, milk bath. Let our Astral Spa transport you to a whole new world with treatments inspired by rituals from exotic cultures. You’ll also find a hair salon, a Thallosotherapy pool, and an assortment of the finest spa products. Keep up your fitness routine or embark on a new one with our onboard Fitness and Wellness Center. Take part in yoga at sunset or toning Pilates; our onboard Wellness consultant is there to assist you every step. You’ll also find quality apparel and more. We know that you will want to share your cruise experience with friends and family – even before you return home. eConnections is where you’ll find onboard Internet stations to stay in touch. Akin to dining in the comfort of a friend’s home, our buffet restaurant is casually elegant with a welcoming atmosphere and spectacular views. Choose to dine inside or out and feast on a lavish display of culinary genius for breakfast, lunch or dinner. While there, be sure to admire the creations of our sugar and chocolate artists; the experience is sure to impress.